Costs – Planning a tree landscaping project in Indianapolis, Indiana? No worries! We have all the information you could need concerning costs for tree maintenance, removal or stump uprooting before you call someone. FAQs – Happen to know the state tree of Indianapolis? Find out that and more about trees in the state, including which ones you should plant, hardiness by zone in the state, the tallest and most popular ones to find around town and what the best time of year is to remove one from your backyard without hassle. Services – Got all of this down on a piece of paper? Jot down a number of one of our professionals listed below so you’re ready to go whenever! How Much Do Tree Services Cost in Indianapolis? The proper maintenance for trees and shrubs requires regular trimming, pruning and cutting. Some homeowners opt to do this on their own, and others choose to hire a licensed, insured and bonded tree service company for these routine tasks. We’ve listed the prices for tree maintenance and tree or stump removal in Indianapolis below. On average, tree removal costs Indianapolis residents between $402 and $568. The higher-end costs typically occur with tall trees and those with a lot of foliage. Some species also have complex branch patterns that can become intertwined with power lines or reach your home, requiring pruning ahead of time. The lower end accounts for trees with thin trunks or short heights. On average, residents will pay $485 to have the tree removed. The cost for stump grinding ranges from $75 to $150 per stump in Indianapolis. This is because the stump will remain in the ground, but it will close enough and flat enough on the ground that a lawnmower will be able to go over it, and grass will able to grow. It will seem as though the stump isn’t even there. Comparatively, removing a stump in Indianapolis will cost between $250 and $300, since it will take uprooting the stump from the ground entirely and hauling it away. Tree trimming, pruning and cutting in Indianapolis will cost between $240 and $348. Costs can be on the high end if the tree is close to power lines. Some species also have complex branch patterns that are difficult to reach. Depending on the species and individual circumstances, costs will vary. On average though, it will cost residents $294. Indianapolis is home not only to the Indy 500 but also to a host of beautiful types of flora, including some majestic species of trees. Learn more about what kinds of trees could complete your yard with the information listed below. 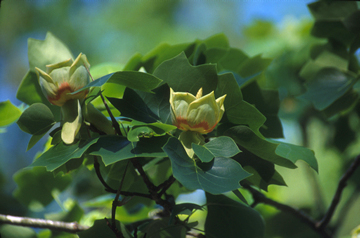 The tulip poplar (Liriodendron tulipifera) tree is the state tree of Indiana. Also known as the yellow poplar, it has a distinctive leaf shape and produces beautiful yellow, bell-shaped flowers. It can be seen throughout the entire state and is prominent in the landscape of Indianapolis. It’s one of the fastest growing trees in the state and the tallest of the eastern hardwood trees in the United States. It actually used to be the state flower from 1923 to 1931, but legislation eventually went through that changed it to becoming the state tree instead. Indianapolis is home to many beautiful trees and proudly displays them at its many parks. The American beech (Fagus grandifolia) can be admired at Ellenberger Park. In the winter, its beauty is enhanced with fresh winter snow blanketing its majestic branches. Locals can enjoy the historic Kile bur oak tree on Beechwood Avenue. This burr oak is 400 years old and 92 feet tall. With its crown spreading over 125 feet and its 68-inch trunk, this tree is more than impressive. It derives its name from the Kile family that lived in the area during the 1900s. Both the Irvington Garden Club and the Irvington Historical Landmarks Foundations work together to maintain this historic tree. The chinkapin oak (Quercus muehlenbergii) stands proudly in Sahm Park. It’s estimated that it is over 200 years old, and its ornamental branches are breathtaking. In University Park, locals can enjoy a collection of stately ginkgo trees surrounded by a cascading water fountain. With warm summers and Canadian fronts in the winter, Indianapolis is prime for apple, pear and other fruit trees. Prima apple trees (Malus domestica) thrive and are immune to scab disease. The apples produced are bright red and medium in size. These trees can grow up to 30 feet and are prolific producers. Golden delicious apple trees also thrive and produce fruit that is ideal for desserts. These fruit trees grow up to 20 feet and adapt well to different weather conditions. The Montmorency cherry (Prunus cerasus) trees thrive in a variety of well-drained soil types and produce both sweet and tart cherries. Many of the locals use the fruit to make preserves and cherry pies. American plum (Prunus americana) trees are also popular and grow up to 20 feet. These trees are cold, hardy and produce a fruit that is ideal for jam and pies. White flowers bloom in early spring, and American plum trees do well in soil that is drained well and moist. The royal empress (Paulownia elongata) is a common species that does well in the Indianapolis climate and soil. It can grow 18 feet in a single season and reach up to 50 feet tall.The royal empress tree sports beautiful light pink flowers and requires partial sunlight. The autumn blaze maple (Acer x freemanii ‘Autumn Blaze’) is another beautiful tree that thrives well in Indianapolis. It has deep red foliage and is eye-catching during the fall season. 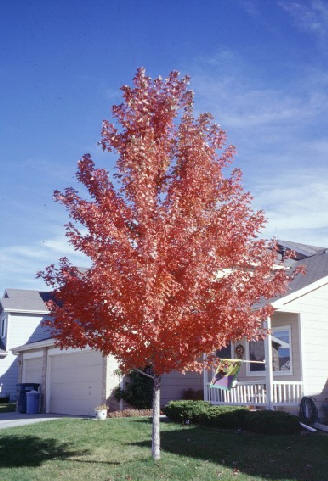 Growing to 50 feet in height and 40 feet in width, the autumn blaze maple is majestic. It also requires partial to full sunlight on a regular basis. Any tree can make an impressive impact on landscape, but a large shade trade can truly add poetic inspiration along with practical benefits. Large shade trees convert carbon dioxide to oxygen, sustain wildlife, avoid soil erosion and reduce heating and cooling costs by 25 percent. The red maple, Norway maple, sugar maple, red oak, weeping willow and green ash are some of the tallest in the city and all grow over 50 feet and offer superb color during the fall season. 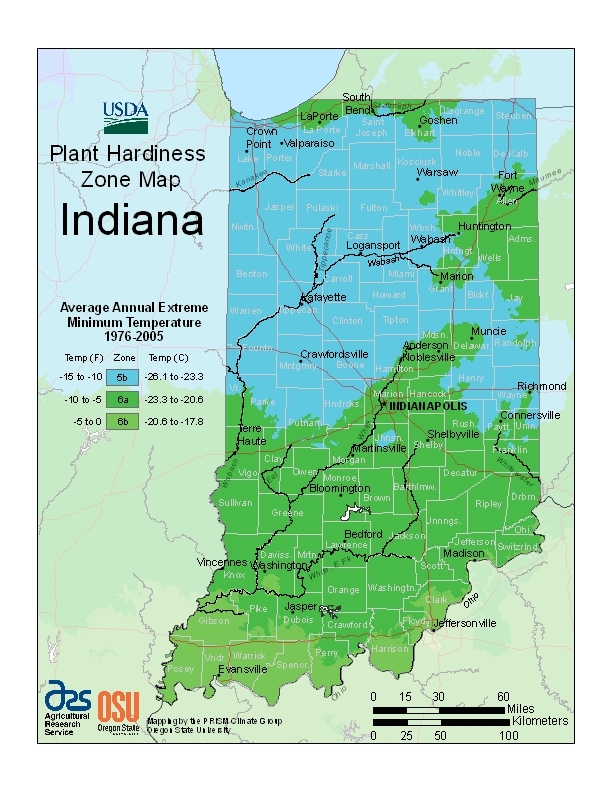 All of these species do well in the Indianapolis climate and soil. Becker Landscape is also a tree service provider in the Indianapolis area, serving all with high quality tree care and professionalism.